Just hours after the first official poster began making the rounds, a trailer for "Gulliver's Travels" has arrived. 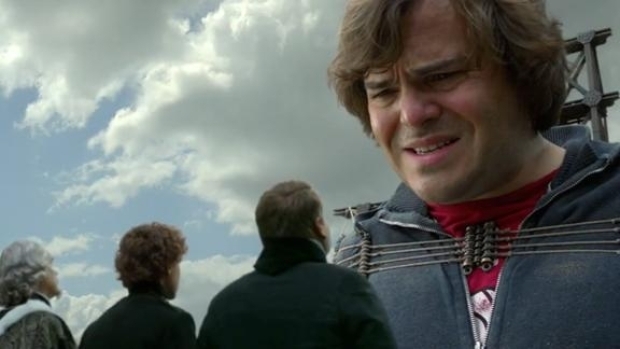 The film stars Jack Black in all his mugging glory as a regular guy who winds up in a land where's he's a giant. "Gulliver's Travels" is directed by Rob Letterman ("Monsters vs. Aliens," "Shark tale") making his live-action debut, and features an impressive supporting cast that includes Jason Segel, Emily Blunt and Amanda Peet. The line, "You're never gonna get any bigger than this," that's dropped on Gulliver is beyond grating. Let's hope there aren't too many more like it. Would someone please, please, please start giving Romany Malco bigger, better parts? He's one of the most inherently funny actors working today, why can't someone cast him appropriately? Kudos to Jack Black for rocking a Rucker Park T-shirt, it'll be lost on 99.9999 % of the audience, but still a nice touch. The clip finishes strong with what is probably the funniest Foosball bit in movie history -- if that means anything. The film comes out Dec. 22.